This very rough sketch, from memory, gives an idea of what could have been a significant memorial to the history of Stockton. I hope it will encourage others who remember this bridge to add more details. It was demolished in the 1960’s. The bridge was a simple brick or stone arch over Lustrum Beck. Judging from old maps, it was built very close to what was then the mouth of beck, where it entered the northern loop of the old River Tees. It carried Portrack Lane, which wasn’t much more than a track, across the beck. One of its main purposes would have been to get men and horses close to the river loop to enable them to haul ships up to Stockton. So it must have played a vital part in ensuring Stockton’s development as a port. After the loops on the old River Tees were closed off in the early 1800’s, it was necessary to make a new channel for Lustrum Beck, down to the River Tees, where it now flows through a sluice on the river embankment. The Packhorse Bridge would have fallen into complete disuse when Portrack Lane was extended towards Haverton Hill. A new road bridge, of rectangular form was then built, and I have tried to show this in the background. Around the early sixties, the channel below the road bridge was straightened, bypassing the Packhorse Bridge. The Packhorse Bridge was then completely demolished. I don’t suppose there are any photographs of it in existence? Keith, that is correct. The Beck went past Lustring House next to the Old Mill and on under Browns Bridge, Londonderry Bridge, Primrose Hill, under the North Shore Junction, Norton Bridge, Belle Vue Gradens and on to the River Tees. The name like many was probably a changed by local use over the years to Lustrum Beck. A lot of the land it covered would be Farmland or Allotments also the North end Recreation Ground which is on the late 1800’s maps. Stockton and Tilery Plus what was then Saint Anne’s Hill had long streets of housing for the workers in all the Mills and Iron works which abounded at the time. There had been a movement to give people open land and Parks as a towns lungs to let people get away from the smoke and grime prevalent even in my time. The fog rose from the River mixed with Smog from coal fired Mill Chimneys who all had Boiler rooms to work machinery plus of course the myriad house fires, when I say we at times went into Town with the Conductor walking in front of the Bus guiding the driver I am not believed. Lung problems were prevalent at the time, no sprays back then people actually smoked Asthma cure including my dad, a mix of tobacco and chemicals that I could not stay in the same room with when it was burnt yet Dad swore by it. We have come a long way and as I looked out of the window on an upper floor of North Tees Hospital two weeks ago noted the changes. Clear skies, clean air, you could see for miles and from high up Stockton is a very Green area. Now you know why I say never go back, look to the future. Lustring seems a much more appropriate name for a stream. The name change was also applied to the house, Lustring House became Lustrum House. Maps upto 1899 show Lustring, from 1915 onwards show Lustrum. Dr Fred Starr, Very interesting reading all about the Tees, Lustram Beck, and Portrack area’s. My Uncle Fred Kidd owned Fred Kidd and Son Engineers and Brass Founders on Church Row as it was known in my time. His works stood on the right immediately having passed under the bridge on banked ground served by a service road from the roundabout which was not there in my time. It was a busy works running a three shift scheme during the war on war work. Some of the work was secret of which I know very little about, but I did work for them for about two years in the Time Office which I did not enjoy docking money for lateness etc. However it was my first job after leaving school, I felt awful having to go into the Board Room to give my reasons for leaving. I have in my possession map of the Old Suspension Bridge across the River Tees – it was a failure having too much deflection in the middle when a loaded train went across. But I would like to know exactly where it was sited across the river to the coal staiths. Any answers please. Peter McGlade is right about the cast iron pipe which must have contained effluent from somewhere. I also recollect that there was a slight hump in bridge and that all the parapets had gone, with the bricks having been dumped in the beck. Downstream of Stockton, by the late 1950s the Tees was in an appalling state with loads of male contraceptive items floating up and down on the tide. Its not a subject that I like to mention, but it does show how much cleaner things are now. Finally, could it be that the course of Lustrum Beck was straightened in the late 17th or early 18th century? From the vicinity of Hartburn Brook, which itself seems to have had some straightening, the course of the beck is a series of almost straight sections. One result would have been the formation of Tilery Recreation Ground which, being so flat , looks like it could have been a flood plain before the improvement of the beck. I recollect a walk down by Lustrum Beck when I was about 14 or 15 around 1956, which led to me being categorised as a hooligan, only because of a bit of idle curiosity. Probably because of the development of the new estates around Stockton, and the increased run off, the beck would often flood and spill over into the surrounding fields. On one of these occasions another kid and myself decided to explore the floods by tracing the beck all the way from the Rocks Field recreation ground, in Portrack, to where Lustrum Beck entered the Tees. This was quite safe as although a lot of fields were flooded, the dykes formed a safe path. But when we got to where the beck ran into the river, we came across a miniature lake, with a real whirlpool, just like what forms when water runs out of a sink, but about six feet across and three foot deep. The water was going down into the sluice gates, which can normally be seen at the bottom of the river embankment, but were then totally submerged beneath the temporary lake. On the river side, because the tide was out, a huge roaring jet of water was cascading into the river, through the sluices. The noise, the velocity, the spray and the browny-white colour of the jet rivaled Niagara. Seeing the whirlpool, and seeing some broken branches lying around, I did what any normal boy would do, which was to throw them into lake, to see whether they would be sucked down by the whirlpool. What I hadn’t realised, that among the small group of bystanders, was the man who had spent the morning clearing the debris and tree branches from the sluices. Quite rightly, I now recognise, he was beside himself with rage, and forced us two hooligans to go back home the way we came. Jonathan May is curious about the area around Portrack and how rural it was. There wasn’t much except farmland between the edge of the Malleable Works in Portrack and the Haverton Hill/ Billingham complex, this comprising the ICI, the Furness Shipyards, and the North Tees Power Stations. The now defunct political magazine, “Time and Tide”, in connection with the 1962 by-election, mentioned a flight over Stockton, in which the then mayor boasted about the area being the “lungs of Teesside”. The main bit of blight was the Corporation waste tip that lay on the south side of Portrack Lane between, roughly, Lustrum Beck and the Billingham Branch Line. The North Tees industrial estate was being expanded and there was also a similar area just down the lane from Portrack, opposite the Malleable. Lustrum beck may be a corruption of “Lustring”, which means bright and sparkling. When the back was running normally it was quite an apt description, except when it was flooding after heavy rains. However, around the late eighties, I took a walk down where the old Packhorse Bridge had been. The beck at this point was black, oozy, and stinking. The results of years of dumping rubbish on the Corporation tip had led to serious contamination of the ground water, which drained into the beck. I had this is in mind when I came to write a report for the EU on some aspects of waste incineration. Fred, you may well be correct in suggesting the origins of the name, as the 1856 O.S.Map (6 inch) shows the name as Lustring Beck. Very pleased that this crude picture has elicited comment and hope that any pictures or maps of the beck and bridge can be recovered. Looking at the aerial picture epw 038899 in Britain from Above, and the old OS map (which came from the Scottish National Library), it is clear that I have got the position of the bridge slightly wrong. It is more at a right angle to Portrack Lane. Chris Bailey is right in saying that there were a lot of hedges along Portrack Lane, but my drawing skills were not good enough for these and I could not remember them accurately. What I have tried to do is show that there were wide dykes or embankments around the beck. These might have dated from the time when the beck was joined directly to the river and when the lower reaches would have been tidal.. The aerial view from 1932 seems to show that a lot of work was being done around Lustrum Beck. This would have been in connection with the improvement of Portrack Lane towards Haverton Hill and joining up with the new road to the Newport Lift Bridge. 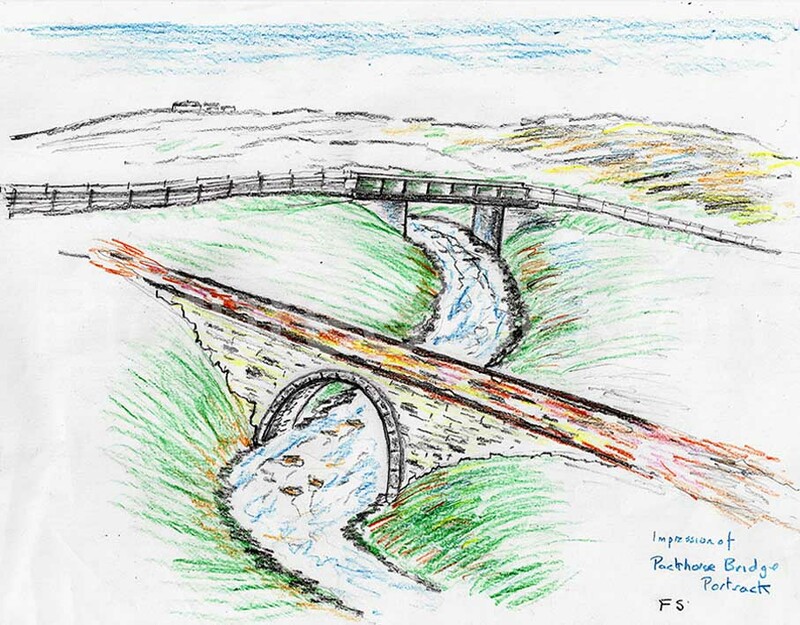 There was also work, further down the beck where a bridge, was required for the Billingham Branch Line. .
Fred, For me Portrack was always been industrial and commercial so thanks for the sketch as it’s allowed me to take an interest and see it in a different light. It’s also interesting that the old Portrack bridge would of been right on the river’s edge before the cuts were made. As the original Portrack Lane ended at Portrack Bridge it explains why the road from there, past B&Q etc, towards the Portrack roundabout/A19 is called Haverton Hill Road. At the Stockton end, Portrack Lane is now a bit fragmented, it goes as far as the roundabout at the end of Dugdale Street (straight on is Church Road), then bears right, until it bears both left and right! In the very early 60’s as a 14yr old grammar-school pupil I became interested in the ‘cuts’ made in the River Tees meander as part of my ‘local history’ project. I can recall at that time, Portrack Lane had a fairly ‘rural’ aspect about it with hedges still being present to both sides of the road. The stonework buttresses of the ‘pack-horse’ bridge were still in place, to both sides of ‘Lustering (Lustrum) Beck’ at that time. Somewhere, in the loft of my 97 yr old father’s house, there will be the maps I drew and some grainy b&w photographs of those remnants, those taken with my trusty 1950’s Ilford ‘Sportsman’ camera. The ‘Portrack House’ at that time, I recall was occupied by Villa Car Sales which also had a motor-salvage yard to the rear and side. Portrack: Site of a loop in the River Tees which was made redundant by a cut or canal. Here heavy ships were pulled by ropes to the port of Stockton. This was known as tracking – hence Portrack. Mervyn, not totally sure, and I may be corrected on this, but I think its the beck that goes under Norton road near to where Swainby road is/was. Then it can be followed back to the edge of Eastbourne/Primrose Hill estate where is travels under the bridge on Durham road near to Newtown school, then under Browns Bridge. Then it goes back to the edge of Oxbridge Cemetery and travels under the road to follow the outskirts of Ropner Park, it then goes under the road close to the entrance of the Bowls club in Hartburn just down the bank from the Stockton Arms pub. From there is travels around the outskirts of Hartburn Village and goes under the A66 not far from its junction with Yarm back road. On the 1897 Map of Stockton and Thornaby, it shows Lustring (Lustrum) Beck as starting in the Hartburn Area. There was a Hartburn Beck which flowed into and became Lustring Beck at Hartburn Bridge, not far from Ropnor Park. I’ve seen various maps that seem to differ in what the beck is called at various points. It starts as Hartburn Beck and becomes Lustrum Beck, but where that happens seems to open to debate, it could be next to West End Bowling Club , or as it passes under Hartburn Ave or alongside Ropner Pond. Not sure how those in charge of such things decide? Anyone know why it got renamed from Lustring Beck? Could the name change have anything to do with Lustrum Hall in the Newtown area of Stockton, did this hall have large area’s of associated land through which the beck flowed. I would guess that Lustrum Hall was named after the beck….the change from Lustring to Lustrum may have come about as people mispronounced or misheard it, due to dialect, etc., and Lustrum just came into common use, eventually superseding the original spelling. The Hall seems to change name from Lustring to Lustrum at the same time as the beck, somewhere around early 1900’s. Lustring – a glossy silk fabric, or a satin-weave fabric resembling it. Lustrum – a term for a five-year period in Ancient Rome. Lustring seems more appropriate for describing a ribbon of water through the landscape. The name Lustring Beck first comes up between Lustring House and Greys Cottage. Lustring House and Corn Mill were near Newby Terrace on Bishopton Road with a cart track from there to the Mill. Why it changed to Lustrum Beck I have no idea it was always Lustrum when the bus conductors called the stops as they did at the time. Dad lived in Norton from his early years and always called it Lustrum Beck.